January 26, 1988 saw the biggest ever gathering of First Nations’ Peoples in their millenniums of history. 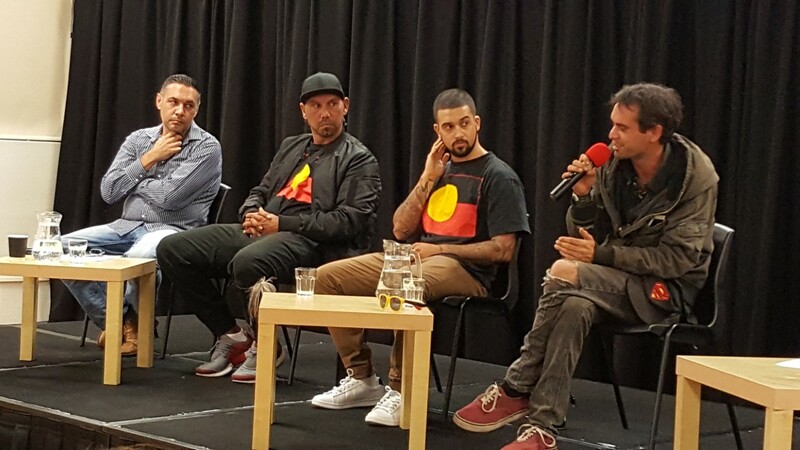 United, they announced their survival in the face of what Tent Embassy Firekeeper, Gumbainggir man, Roxley Foley (speaking, left) calls “the strongest and most consolidated genocide pogrom in history”. By 2000, a million mainstream Australians marched to support First Nations. This Aboriginal-led movement posed a massive threat to corporate rule and access to land. The Business Council of Australia organises the country’s 125 biggest, mostly foreign-owned, corporations. Responding, it began manufacturing consent among hand-picked Indigenous individuals. The price? Land and resources, and acceptance that invasion and capitalist rule are permanent. Corporations find cracks in community and deliberately widen them. Take constitutional recognition. For First Nations Peoples, only Native Title has been more divisive. 31 years ago, Uncle Kevin Gilbert first wrote of Treaty. Anaiwan/Kamilaroi man, Adrian Atkins, says “His vision was for Sovereignty, under a pan-Aboriginal confederacy, a nation within nations”. This vision “spread like wildfire in the lead up to 1988”. Labor PM Hawke promised Treaty, then dumped it. Later, instead of Treaty, BCA members pumped massive resources into constitutional recognition, initiated by PM Howard after advice from a mining company-founded think tank. It was top down, hand-picked, and “shoved down our throats”. (Lidia Thorpe 17/3/18). The police were even called to remove First Nations Peoples, including Gunnai/Gunditjmara woman Lidia Thorpe (now the first Aboriginal parliamentarian in Victoria), from a Referendum Council meeting). By 2014 recognition seemed unstoppable. But grassroots’ Peoples were organising, with Treaty and Sovereignty their battle cry. Attempts to silence them failed, and even compromised constitutional change proved too much for the Coalition Government. Struggle deepens understanding. Some First Nations Peoples still look to Treaty with governments, but growing numbers reject this. Instead they systematically rebuild unity through Treaty between neighbouring mobs, based on informed prior consent. Sovereignty was the heart of Kevin Gilbert’s vision and is still the key today. 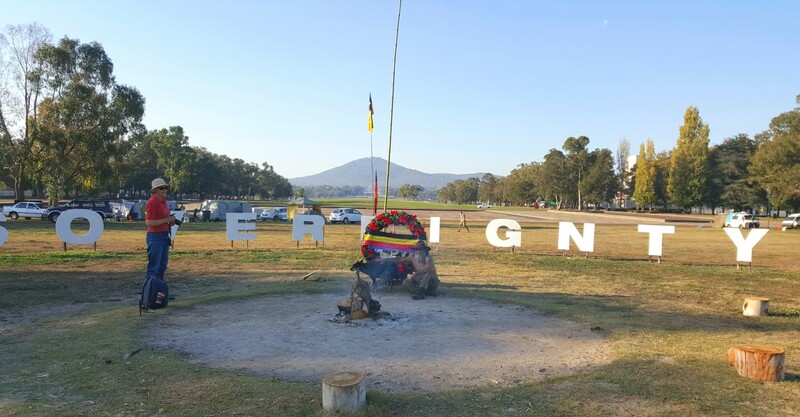 FISTT (Fighting in Solidarity Toward Treaty) representative Gomeroi man Cameron Manning-Brown, says, "Treaty sets the foundation for us, the Sovereign First Nations peoples of this land, to determine our own futures, on our own terms, in all aspects of our lives." Cameron Manning-Brown agrees, “I will not be talking Treaty with a corporate government until it severs ties with Britain,” he says. He says, “Don’t let them think we’re coming to the table alone and to surrender. It’s their throat we’re looking for. And when we come, not only will we come together with our mob, but we’ll come with the vast majority of the Australia people backing us up as well. First Nations Peoples, taking forward the experience of their Elders, organising in new ways, in new groups, now mobilise tens of thousands. Rejecting division and despair, they are building that promised land.